WINNIPEG, Oct. 11, 2018 /PRNewswire/ – DELTA 9 CANNABIS INC. (TSXV: NINE) (“Delta 9″ or the “Company”) is pleased to announce that it has closed its previously announced acquisition of the land and 80,000 square foot building containing the Company’s current cannabis production facility (the “Property”) from 6599362 Canada Ltd. (the “Vendor”) for a price of $6.25 million, subject to certain closing adjustments and conditions. The Company has also purchased certain cannabis grow pods (the “Equipment”) from the Vendor for a price of $952,000, plus applicable taxes. The Property is located in a heavy industrial area in Winnipeg, Manitoba. The production facility of Delta 9 has been located at the Property since July, 2013. The Vendor is a non-arm’s length party of Delta 9 due to the fact that a director of Delta 9, Joanne Duhoux-Defehr, is also a director of the Vendor and is the owner of 20 per cent of the issued and outstanding shares of the Vendor. Accordingly, the acquisition of the Property and the Equipment are considered to be a non-arm’s length party transaction and are subject to the approval of the TSX Venture Exchange (the “Exchange”). The Exchange has granted its conditional approval for the acquisition of the Property and the Equipment and final approval of the transaction is subject to certain final filings with the Exchange. A demand operating loan of $2,000,000 to be used to finance day-to-day operations. Interest will float at a rate of 1.00% per annum above CWB’s prime lending rate, which at the current time is 3.45% per annum. A demand revolving loan of $4,500,000 which was used to fund a portion of the acquisition of the Property. Interest will initially float at 1% above prime, but CWB will use its best efforts to obtain funds on a fixed rate acceptable to Delta 9 and CWB, which is intended to be at between 4.68% per annum for a one year term up to 5.45% per annum for a five year term. A demand non-revolving loan of $4,500,000 to assist in the purchase of lands adjacent to the Company’s current production facility, as previously disclosed by the Company. Interest will float at a rate of 1.00% per annum above prime, with fixed rate pricing subject to negotiation up to the date of draw down. A non-revolving credit facility of $1,000,000 for the purchase or lease of equipment required for the operation of the Company’s business. Interest will float at a rate of 1.75% above prime, with fixed rate pricing to be the subject of negotiation up to the date of draw down. This facility was used to fund a portion of the purchase price of the Equipment. Delta 9′s first phase of expansion is on track to increase annual production to 17,500 kilograms of cannabis annually by the end of 2019. Further expansion is planned on a “Delta 9 Cannabis Campus” slated for construction on an adjoining parcel of industrial land. Delta 9′s wholly-owned subsidiary, Delta 9 Bio-Tech Inc., is a licensed producer of medical marijuana pursuant to the ACMPR and operates an 80,000 square foot production facility in Winnipeg, Manitoba, Canada. 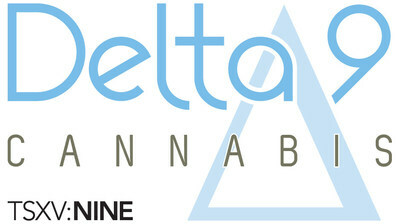 Delta 9 was the fourth company in Canada licensed to produce legal cannabis. Delta 9′s shares trade on the TSX Venture Exchange under the symbol “NINE”. Certain statements in this release are forward-looking statements, which reflect the expectations of management regarding the Company’s future business plans and other matters. Forward-looking statements consist of statements that are not purely historical, including any statements regarding beliefs, plans, expectations or intentions regarding the future. Forward looking statements in this news release include statements relating to: (i) final Exchange approvals for the transaction; (ii) future use of the credit facility with CWB; (iii) adjustment to the interest rates of certain loan segments of the credit facility with CWB; (iv) Delta 9′s future production of cannabis; and (v) Delta 9′s expansion plans. Such statements are subject to risks and uncertainties that may cause actual results, performance or developments to differ materially from those contained in the statements, including those risk factors set forth in the annual information form of Delta 9 dated May 31, 2018 which has been filed on SEDAR. No assurance can be given that any of the events anticipated by the forward-looking statements will occur or, if they do occur, what benefits the Company will obtain from them. Readers are urged to consider these factors carefully in evaluating the forward-looking statements contained in this news release and are cautioned not to place undue reliance on such forward-looking statements, which are qualified in their entirety by these cautionary statements. These forward-looking statements are made as of the date hereof and the Company disclaims any intent or obligation to update publicly any forward-looking statements, whether as a result of new information, future events or results or otherwise, except as required by applicable securities laws.